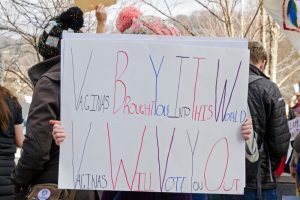 January 20, 2018: A protestor at the 2018 Women’s March in North Carolina holds a sign aimed at Republican lawmakers. A Republican nominee in North Carolina’s 9th District has come under fire for comments he made during his time spent as a pastor. According to Roll Call, former Baptist preacher Mark Harris once told his congregation that wives should submit to their husbands. “Many marriages could save beaucoups of marriage counseling money if they would just understand; husbands love your wives even as Christ loved the church. Wives submit yourselves unto your own husbands as unto the Lord,” Harris said during a sermon in 2013. 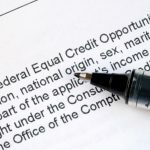 In 1974, the U.S. Senate passed the Equal Credit Opportunity Act, which made it illegal for financial institutions to deny someone a loan based on their age, gender, race, religion, and national origin. Prior to this law, it was difficult for women to obtain a credit card. Harris has since defended his position by claiming that submission does not mean that women are inferior to men. The GOP hopeful has compared the concept to Jesus submitting to God. In this context, the two are still equals, even though there is a clear hierarchy of authority. However, Harris’s views on marriage aren’t the only thing that’s gotten him into trouble. In 2013, he has also questioned whether it’s “healthy” for women to pursue a career. “In our culture today, girls are taught from grade school that we tell them that what is most honorable in life is a career, and their ultimate goal in life is simply to be able to grow up and be independent of anyone or anything,” Harris said. Will these remarks cost Mark Harris the election? That remains to be seen.